Once your kindergartener mastered the alphabet skills, he is ready to make the letter-sound connections. 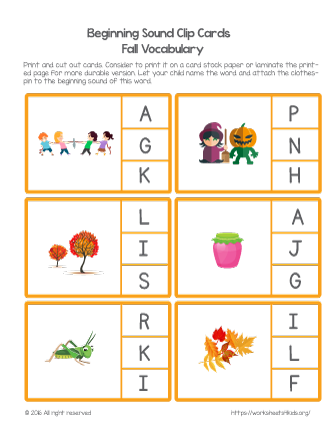 Have him say the initial sound of the fall-themed words in this worksheet. Fall words: game, Halloween, Indian Summer, Jam, katydid and leaves. Don't stop! Keep moving with the fall alphabet! Here's sheet #3!